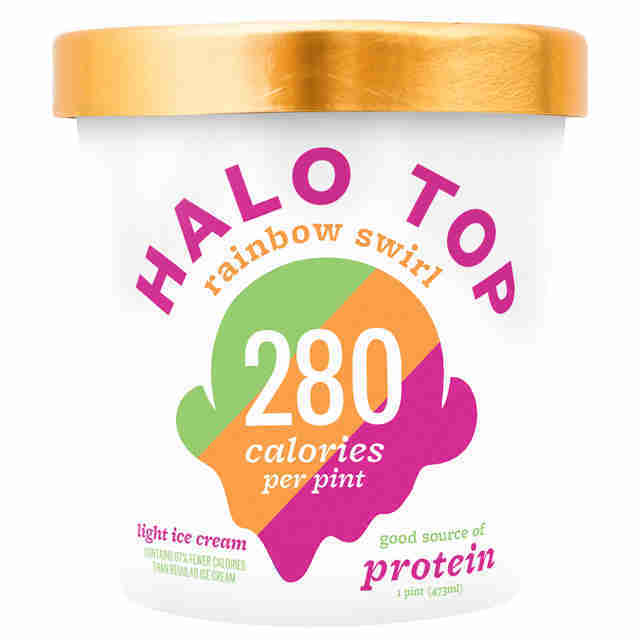 Ever since Halo Top unleashed a roster of low-calorie ice cream packed in colorfully stylized pints, hordes of millennials -- we’re talking those tear-stricken, newly single millennials and dieters in search of non-chalky ice cream supplements -- could pull one or two (or several) pints from the freezer and polish off an entire carton, guilt-free. 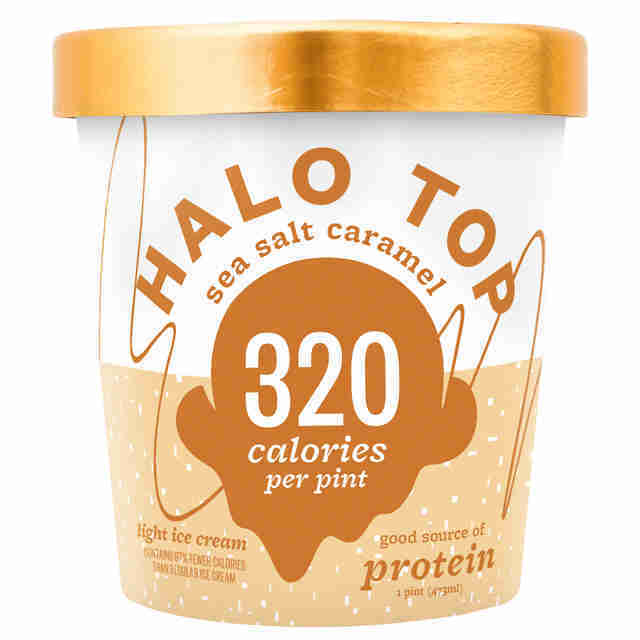 If you’ve never had Halo Top, here’s the 101: The company prides itself on producing low-sugar, protein-packed, and all-natural products, all under the premise that one pint merely boasts anywhere between 240 and 360 calories -- aka about one serving size of leading ice cream brands like Häagen-Dazs and Ben & Jerry’s (although, let’s be honest, no one really adheres to those laughably small serving sizes). 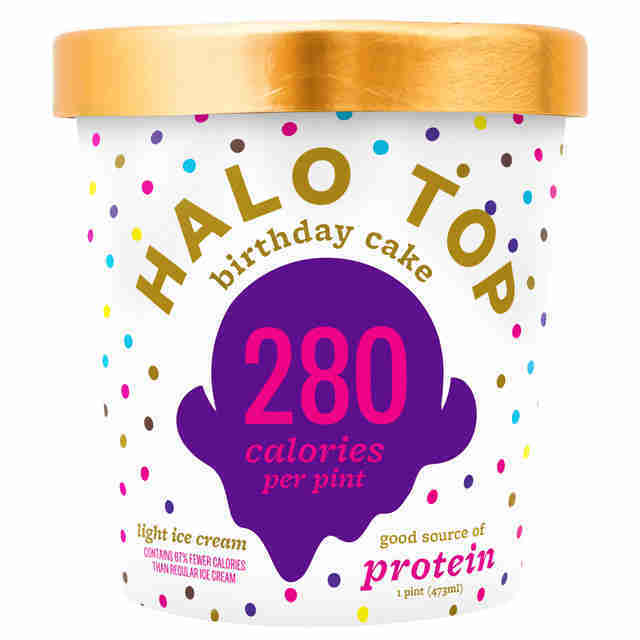 With 25 flavors in a variety of traditional (strawberry, mint chip) and more creative (lemon cake, blueberry crumble) flavors, Halo Top is undeniably everywhere now, amassing adoring followers at every corner of the freezer aisle. But how does Halo Top really stack up? As the resident, self-proclaimed ice cream connoisseur, it seemed only fitting that I sample each flavor. Twenty-five pints and a frightening amount of spoons later, here’s how they each hold up. There was always that moment as a kid, rifling through the bottom of your mostly demolished Halloween candy haul, where you’d discover that all that remained were Mounds bars and a rather alarming amount of banana Laffy Taffy. 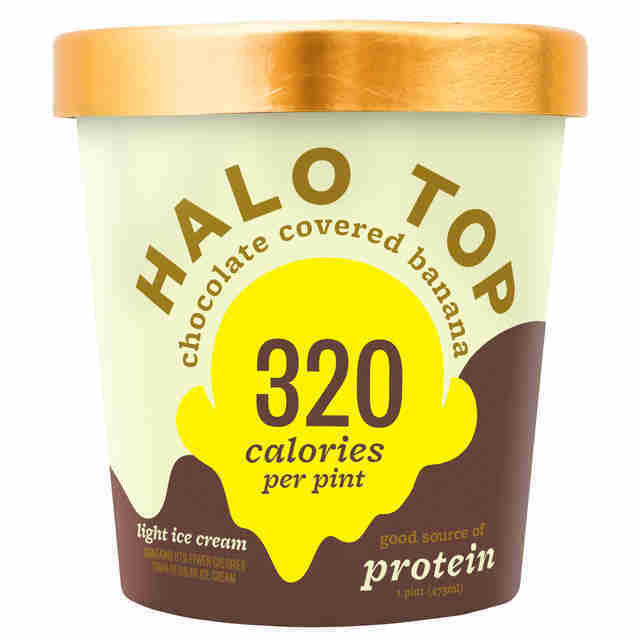 Well, if you’d like to vicariously recollect that moment of sheer, visceral panic, then you should pound through a pint of chocolate covered banana -- this flavor is basically an exact replica of banana Laffy Taffy, just without an overtly chocolate taste. I mean, there’s a reason yellow candies are the most despised of all. Now I know there are people out there who are firm believers that nuts are undeniably inseparable from ice cream (I hear you, Rocky Road people). However, I am a firm believer that nuts should stay out of the business of ice cream. Nonetheless, I have agreed to remain unwaveringly unbiased in this Very Important line of duty when it comes to the rest of Halo Top’s nut flavors. But here’s the thing about chocolate almond crunch: It smells and tastes so much like marzipan drenched in some potent AF almond extract that whatever chocolate flavor used to be there is now firmly cloaked by faux almond. Have you ever dined in one of those grandiose, fancy establishments where in between courses a smart-suited server brings you some strange, unconfirmed substance piled with pillowy foam? It doesn’t taste like much, but you’re told it cleans your palate to prepare you for upcoming courses. 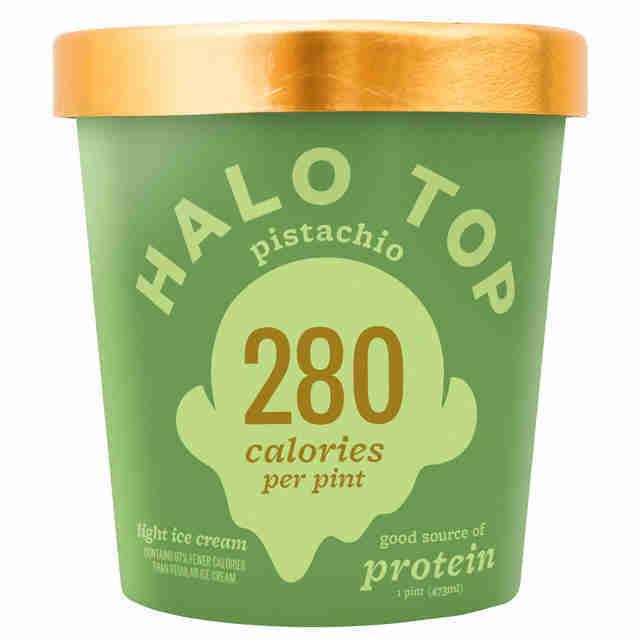 Well, meet Halo Top’s verifiable palate cleansing pint: pistachio. The neon green ice cream bears no resemblance or taste to the tree nut, although it does have a wonderfully creamy consistency and would certainly play a reliable understudy if said fancy restaurant were to ever run out of that foam stuff. 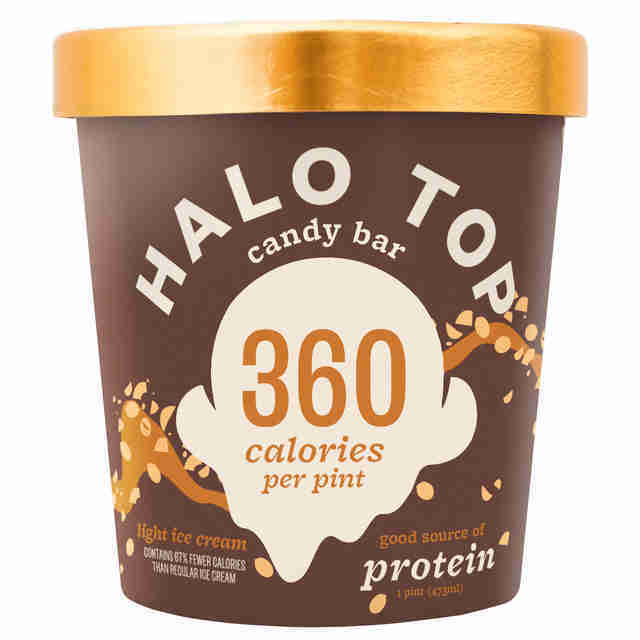 Finally: a perfectly reasonable excuse to capitalize on your pint-sized dream of eating dessert for breakfast. 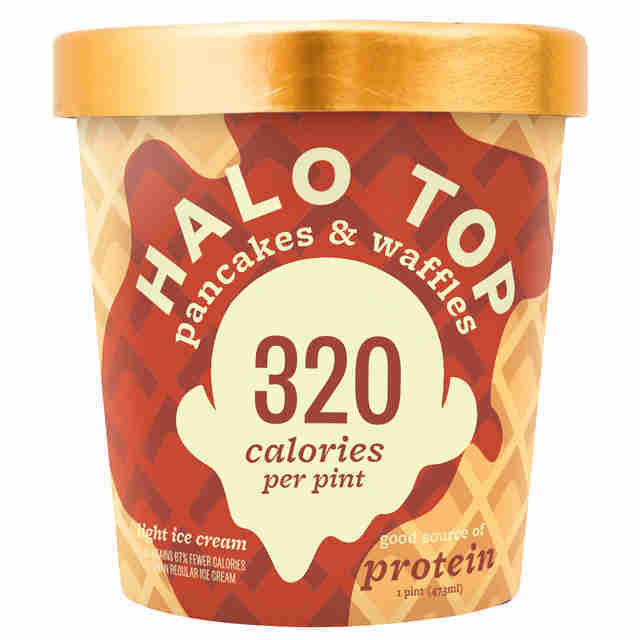 There’s basically a whole balanced breakfast stuffed into this pint: pancakes and waffles and maple syrup and hints of coffee. Does it end up mostly tasting like Aunt Jemima’s syrup? Sure. But so does nostalgia. 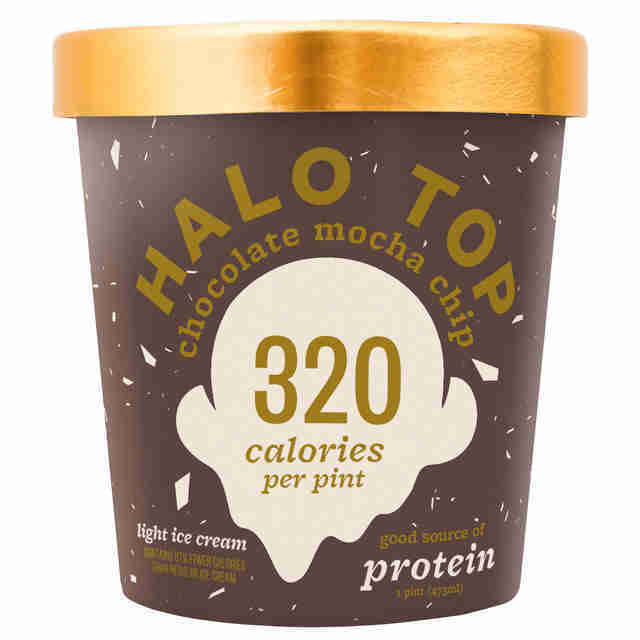 Is it a good or bad thing (or maybe you don’t care) that all of Halo Top’s coffee flavors seem to suspiciously reek of Starbucks Frappuccinos? I suppose if you’re into slurping frothy, sugar-drenched coffee drinks tinged with caramel and crowned with pillows of whipped cream -- without all the added sugar -- then you’re golden with this flavor. However, upon tasting this flavor, symptoms may include systematically slipping back into your 10-year-old Ugg boots. Ah, don’t you wish everything s’mores-flavored burst with that marvelously burnt and smoky punch? This version does not (where are the graham crackers?!) -- it’s mostly a creamy base that’s only somewhat reminiscent of marshmallow, plus a showering of petit chocolate chips (it’s really more like vanilla chocolate chip). So if you want that flavor, then buy this one! OK, but where are the cookies? There’s plenty of cream, for sure, but the cookies? Non-existent. Which just leaves us at & cream. 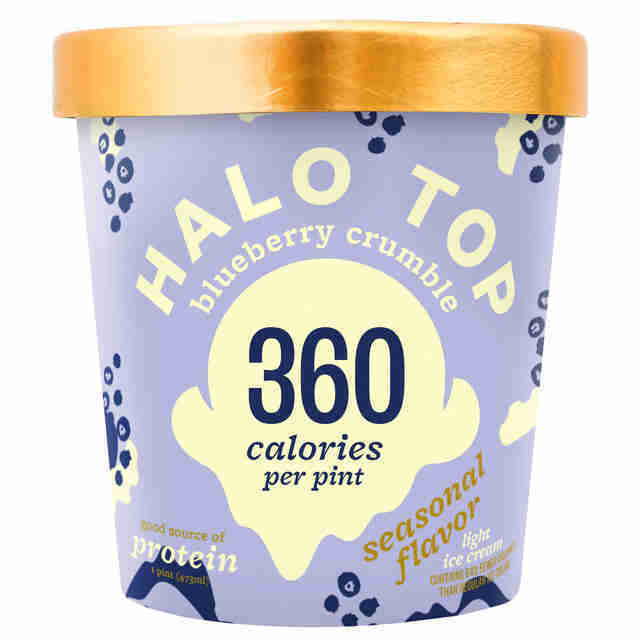 While the newest, seasonal flavor seemingly harks back to summers spent spooning burst blueberries piled with sugary dough clusters, this pint results in that rather thick, blueberry yogurt-like taste. That’s not bad, necessarily (if you’re into that kind of thing), and the big hunks of pie dough swirled throughout certainly don’t hurt. 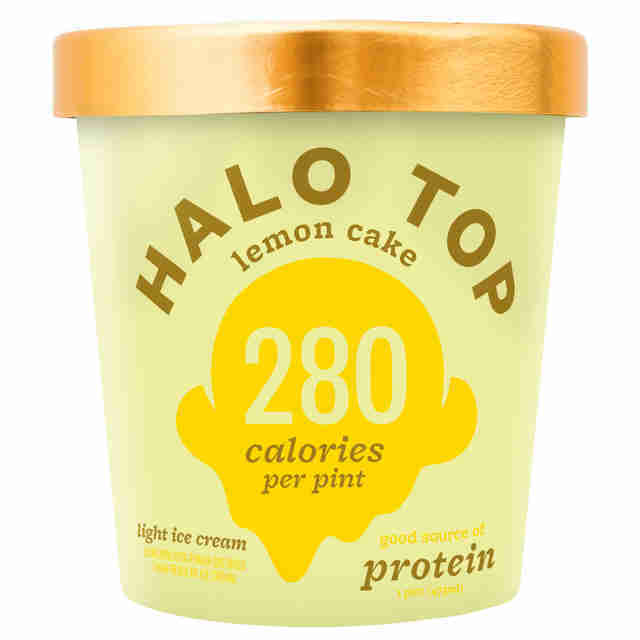 If you’re in search of a tart, overly lemony ice cream, I’ll spare you a trip to the grocery store. Lemon Cake is simply a sweet, slightly lemon-like ice cream that’s more similar to vanilla than it is to lemon. But it would pair quite nicely scooped on top of an actual slice of lemon cake. 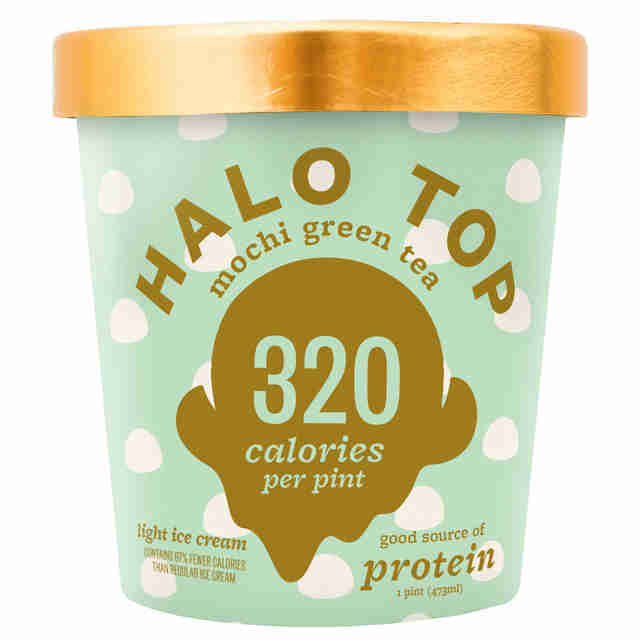 For all you novice green tea drinks, this lime-green pint is a good introduction to falling in love with matcha. It has a more mild taste -- lacking that pungent, rather dirt-like bitterness that’s normally accompanied with green tea -- and could arguably be more reminiscent of perfume than dessert: it’s quite flowery, with notes of lavender, but still manages to remain sweet. Remember your first sip of coffee, one heavily laced with chocolate and at the minimum three sugar packets so you could more easily choke it down? That’s chocolate mocha chip for you: a mousse-like chocolate base churned with bitter espresso and bits of chocolate. The three flavors swirled together here -- lime, orange, and raspberry -- really do taste like their fruit-flavored counterparts. But what they seem to remind me most of are those rainbow push-pops from the early 2000s -- the ones where you’d press gently on the bottom and the whole thing would erupt out of its paper socket and land on the ground in a sad neon pool of childhood despair. 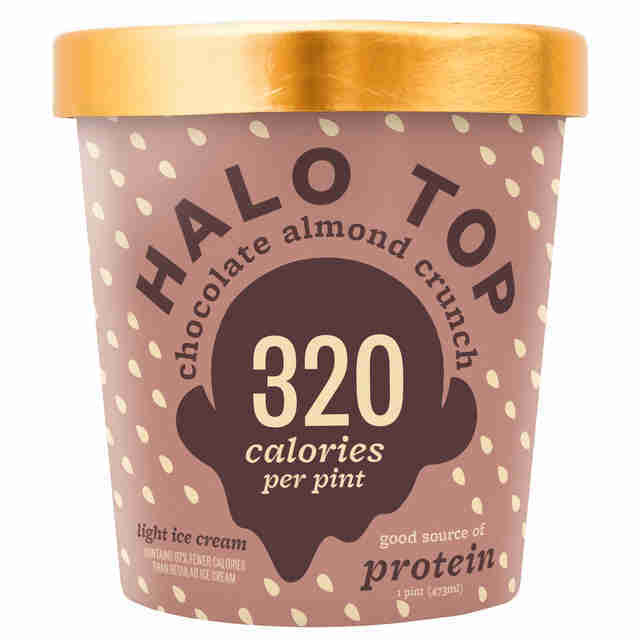 Good thing this version comes in a pint. Just don’t leave it out on the counter too long. 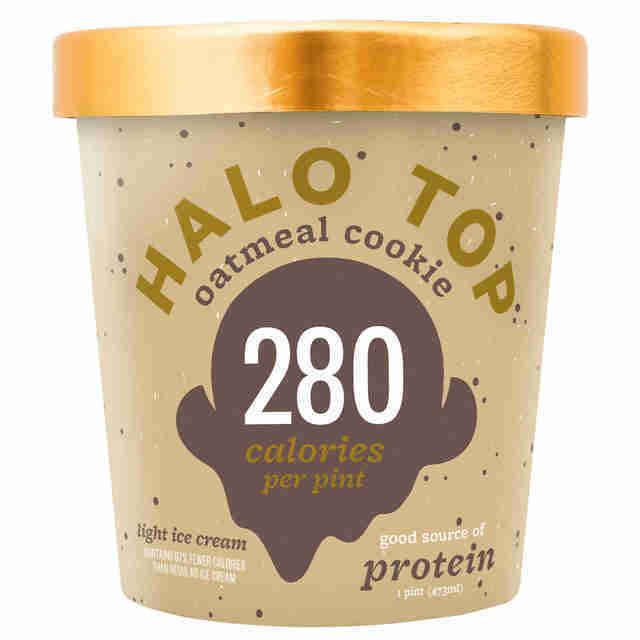 Oatmeal Cookie almost feels too healthy… even for low-cal ice cream. The vanilla-based ice cream is speckled with bits of cinnamon, but what kills it for me are the whole oats folded into the ice cream. They’re much too tough to munch on, especially because they’re uncooked, and a rather unwelcome surprise when you’re expecting something more similar to an actual oatmeal cookie. But then again, if it was littered with hunks of cookies, it surely wouldn’t be 280 calories. If anything, black cherry will elicit feverish pangs for warmer days: the wonderfully magenta ice cream is studded with bits of chewy cherry pieces and only marginally tastes like cherry cough syrup. Here’s the innocuous vanilla -- one that’s not too vanilla, dare I say. It’s splattered with vanilla beans (a nice treat! ), but it has that kind of thick, curdled taste of unbranded, grocery store vanilla ice cream. Melt down a Snickers bar, and voila: Candy Bar ice cream. The creamy chocolate ice cream isn’t merely spotted with roasted peanuts (and plenty of stevia, of course) -- there’s swirls of caramel, too, and with that first lick comes a deep-seated hankering to repeatedly listen to that sweet, sweet sound of tearing open a brand-new candy bar. How can you say no to anything streaked with rainbow sprinkles? And let’s be honest, everyone at some point in their life (probably!) has dreamt of sitting down and eating a whole cake in one sitting. Now you can, in this sort of newfangled, lesser-caloric way: with a polka dot-pint and large spoon in hand. Once upon a time Gogurt was all the rage. Nowadays, as a jaded yogurt consumer, I can infer the point of creating strawberry Gogurt was so parents of vegetable- and fruit-hating children could convince their perturbed offspring that this tubular product was a supplement for Earth’s bounty -- as well as a dessert. If you were one of those children, here’s that same exact flavor, finally (!) in actual dessert form. The best part? You don’t have to worry about unexpected, flying spurts of yogurt staining your clothes. It should come as no surprise that Red Velvet, chocolate cake’s beet-tinged cousin, is wonderfully packaged into a strikingly blood-red ice cream form, one peppered with hunks of brownies. 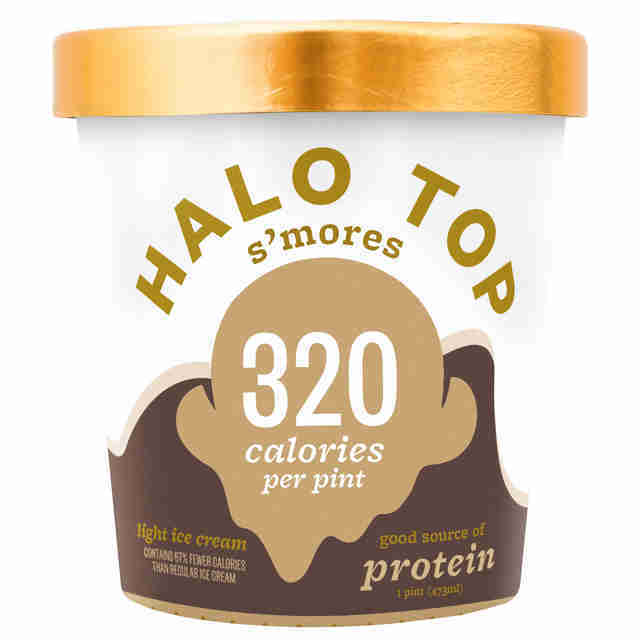 And it should come as no surprise, then, that the whole pint boasts 360 calories -- the fattiest and most caloric of Halo Top’s line. Yet I’m still cradling the pint, fishing out those brownie pieces and watching my tongue turn cherry red. 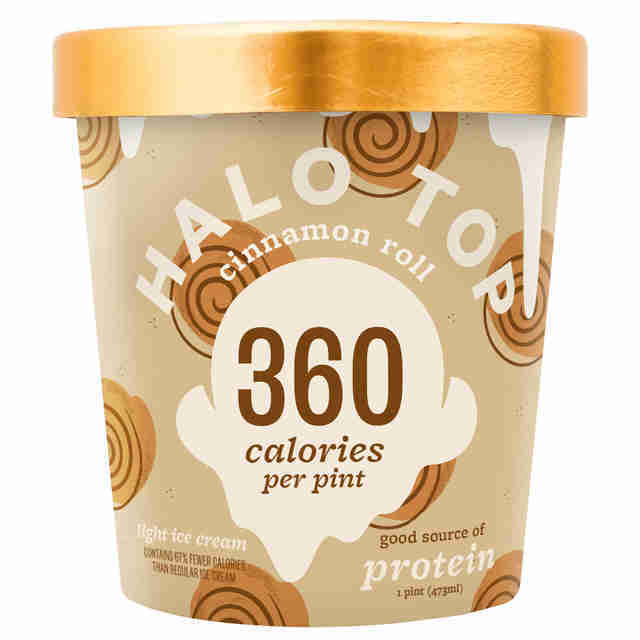 Halo Top launched a stacked roster of new flavors over the summer, and while some didn’t perform so hot (chocolate covered banana, Pancakes & Waffles), Cinnamon Roll was surprisingly one of the best. It’s about everything you’d get with a still-warm mall Cinnabon (minus the egregious trip to the mall): sweet icing swirled into cinnamon ice cream and studded with soft cinnamon-dough nuggets. 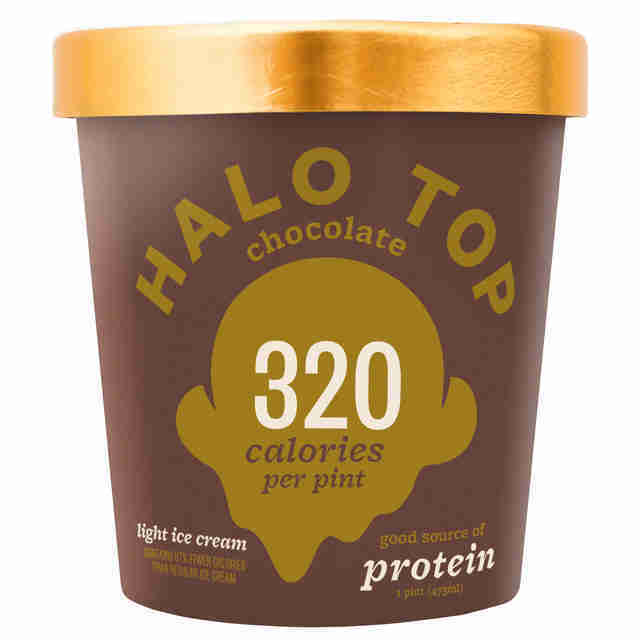 It’s the simplest and classic flavors where Halo Top excels, and that’s the case for their chocolate, which leans closer to milk than dark and reminds me of licking a Fudgsicle, that light chocolate taste refreshing and cool as it slides down your throat. Will it satisfy your chocolate cravings? Certainly, but at a cost: It’s far too easy to eat it straight from the pint, only to look down and discover the spoon has scraped the cardboard bottom. This is exactly like peanut butter. Except an ice cream version tossed with massive clusters of peanut butter and chocolate peanut butter cups. 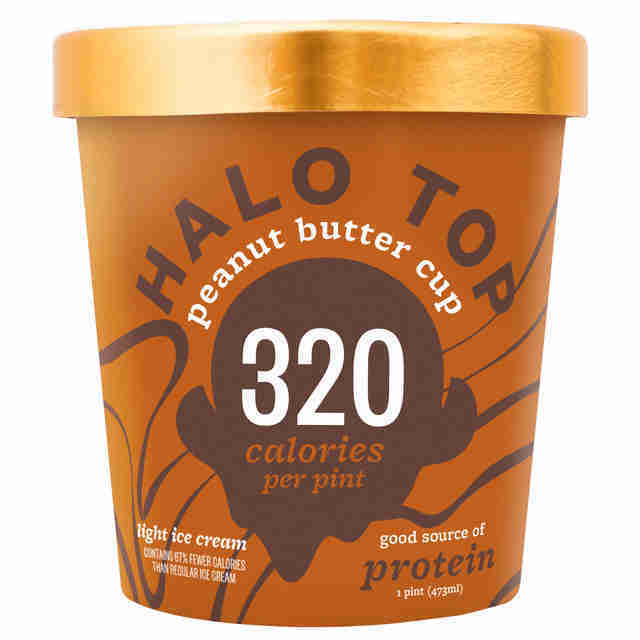 The more you eat this, the more you may very well turn into peanut butter. Or at the very least you’ll subsequently argue that you’ve morphed into a jar of peanut butter. Fact: Earth’s greatest gift to humankind is definitively anything flecked with shards of sea salt. That salty-sweet combo is an eruption of magic and heaven and puppies on your taste buds. If you’re the monster who prefers to keep savory separated from sweet, thank you very much, you’re certainly entitled to your opinion. For everyone else who’s on the side of right (welcome! 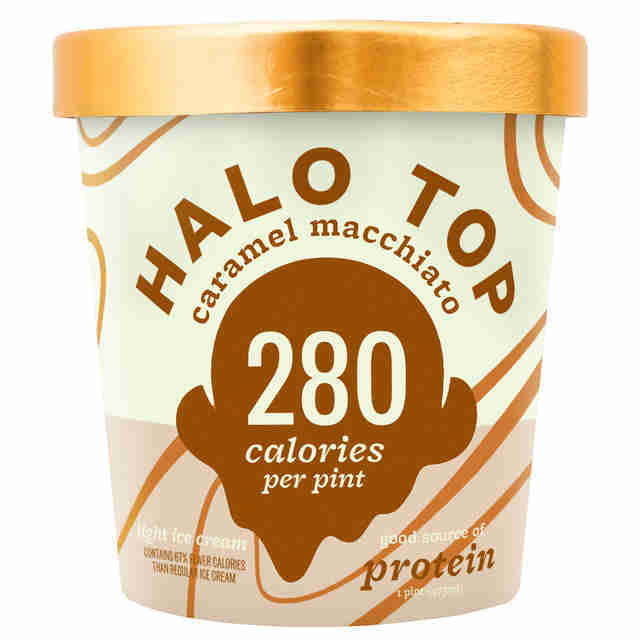 ), you’d be remiss not to dive into this pint brimming with bits of salt and ribbons of sticky caramel. The mint here is delightfully not that fake green color, but more of an off-white cream, punctured only by a slew of mini chocolate chips scattered throughout the carton. The flavor is robustly peppermint -- but most importantly not horribly similar to your toothpaste -- and it feels and tastes so much like a fully sugar-drenched version that while you’re shoving spoonful after spoonful of it into your mouth you’ll question how the whole pint is only 320 calories. 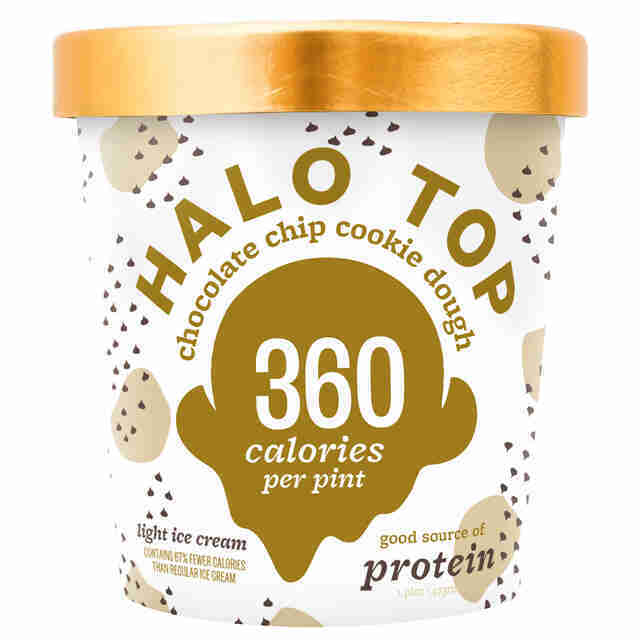 Between the rounds of soft cookie dough and liberal peppering of chocolate chips, chocolate chip cookie dough is easily Halo Top’s best flavor. It’s the kind of ice cream that doesn’t leave you feeling disgustingly ill after consuming only a handful of licks. 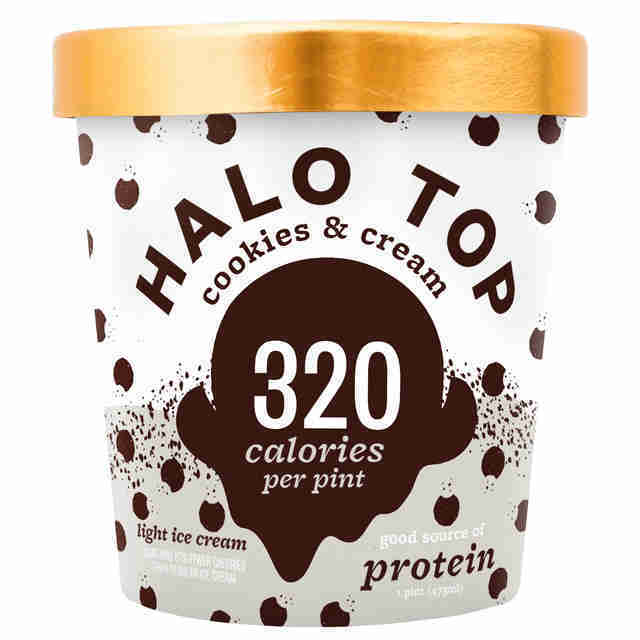 Perhaps most importantly, though, is Halo Top’s willingness to channel the visceral nostalgia of a youthful, fast metabolism: days spent scraping raw cookie dough from the depths of a mixing bowl and licking drippy, cookie dough-studded cones plopped precariously atop cake cones. So from all your devoted fans, thank you from the bottom of our now stevia-caked hearts, for transforming our beloved cookie dough into guilt-free ice cream. We’ll go ahead and eat a ton. Amy Schulman only eats chocolate ice cream. Unless she has to try 25 pints of ice cream for work. Follow her on Instagram.